Audrey O’Brien Griffin lives the cowgirl life with tenacity, generosity and passion. 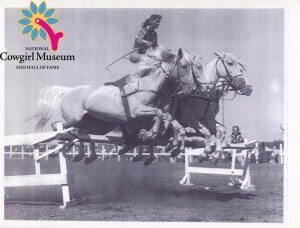 Before raising her family, Audrey was a member of the famous Flying Valkyries, a roman riding group in the 1950s and also worked in a Wild West show that traveled to Belgium. After her children were grown, her love for equestrian sports took center stage and she started team penning, sorting and excelling in overall horsemanship. Her competitive nature remains strong today as she continues to promote the Western lifestyle.